Save Matthews Yard is non-profit company Limited by Guarantee. 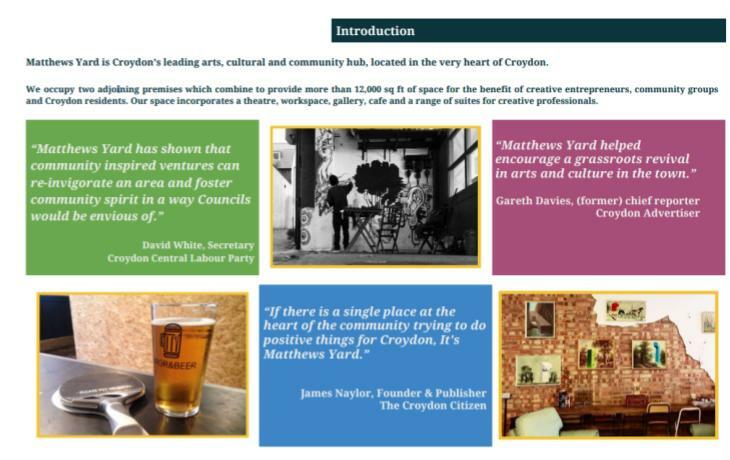 Established in November 2017, the companies aim is to preserve the legacy of Matthews Yard in and beyond Croydon by creating and operating urban spaces which create opportunities for the local community to come together and collaborate to produce great things. Download our Impact Report and find out what we have achieved with only the direct support of the local community in our first five years. Matthews Yard, Croydon’s Community Hub. Impact Report. Matthews Yard has always been reliant on the support of the local community and until now we have been lucky to have it. Without any salaries taken into account, it costs more than £12,000 per month to operate our two premises in central Croydon. Our low price points and flexible approach to working with entrepreneurs and the local community mean we are always playing catch-up and looking for a helping hand. There are many ways that you can support our aims and objectives above and beyond booking a ticket for a gig or spending money with Brgr&Beer. There are simple things within reach of all of you that would help us immensely in our quest of providing an affordable hub for arts, culture and creatives in central Croydon. You don’t need to throw money at us to show us a little love. After all, a simple hello, goes a long way. Send us a tweet, or engage with us on social media. We are a friendly bunch. If you have had a positive experience, write a review of one of our concessions, or of Matthews Yard itself. If we have had a profound impact on your personal or business life, let us know about it or write us a testimonial or blog post. The more we know about what we do right, the more we can do to ensure we do more of it in the future.